I woke in a daze and waddled, still in my sleeping bag, bottom unzipped, feet out, toward the camp kitchen to greet the team. The morning was brisk and we’d gone light on clothes to save weight. My hands snuck out to grasp a cup of hot coffee. Two bull bison emerged in the mist and lazed through the tall grass to the east as we marveled in silence—it felt like a good omen for the miles to come. I’m a big fan of marveling. We were a team of five runners, photographers, locals: Justin Angle, Walker Ferguson, Beau Fredlund, Fredrik Marmsater and me. We’d departed the day before, covering 30 miles of a five-day, 140-mile backcountry traverse from our front door in Cooke City, Montana, all the way to Old Faithful, in the heart of Yellowstone National Park. We wanted to experience, firsthand and on the ground, some of the environmental stories and policies that play out in this microcosm of wildness so iconic to the world’s concept of what “wild” means. DAY 1. 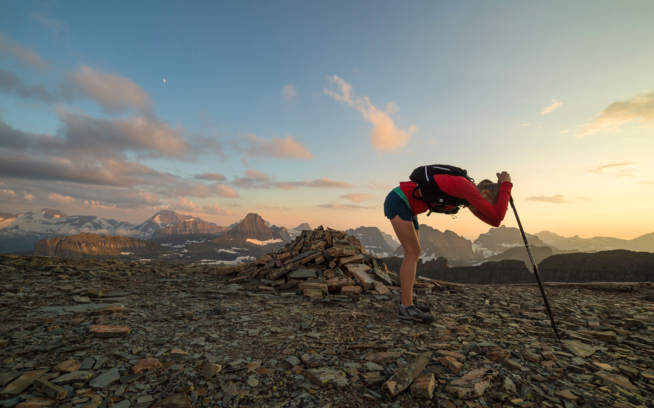 Our route started with a 3,000-foot climb over Republic Pass, where the Absaroka Range boasts some of the most beautiful whitebark pine forests remaining in the Lower 48. Whitebark is a keystone species whose pine nuts are the diet of choice for a variety of animal species, including Yellowstone grizzly bears. Over the past 20 years, warming temperatures have allowed an explosion of mountain pine beetles that have decimated whitebark numbers across the northern Rocky Mountains. But here in the Absarokas, the trees are still holding strong. So far. As we crested Republic Pass, the expanse of Cache Creek dropped away below us. Once filled with whitebark, Cache Creek was scorched by one of the many wildfires that raged through the summer of 1988. After years of fire suppression, new park wildfire management policies had recognized the importance of wildfire as an ecological driver and instated a policy commonly known as “let it burn.” That hot, dry summer, more than 793,000 acres of Yellowstone National Park burned, including Cache Creek, leaving huge swaths of land seemingly barren and monotone. Whitebark takes decades to regenerate. A tree whose trunk I could comfortably wrap my arms around might be as old as 500–700 years. Now 30 years after the massive burn, new whitebark growth stands sparse in this valley and barely taller than me. We continued down valley to the confluence with the Lamar and turned south, heading upriver to our first camp. DAY 2. We took off with 25 miles ahead of us, over Mist Pass and into the Pelican Valley. As we started, I wondered if we’d pass the two bison we’d seen that morning. Bison don’t have many predators in the Greater Yellowstone and so are not afraid of much; even wolves only go after the calves, the elderly or the injured. Yellowstone is the bison’s rightful kingdom. Nearly obliterated by indiscriminate hunting and poaching in the late 1800s, bison finally found legal protection in 1894 when Congress passed the Lacey Act, the first federal law protecting wildlife. At the time, an estimated 23 individual bison remained. Through huge efforts to protect, breed and repopulate, bison have rebounded and thrive within park boundaries today. As we passed the two bison again a few miles up valley, I felt thankful for this desperate conservation success story. We rolled through the vast Pelican Valley, struggled through a hot, dry section of trail and arrived at our second camp on Yellowstone Lake. DAY 3. We danced along the edge of the Thorofare, the most remote region in the Lower 48. The morning miles went easily; the air was brisk, the trail smooth, the views incredible. We skirted Yellowstone Lake. At 132 square miles, it’s the largest lake above 7,000 feet in North America and has a crucial population of cutthroat trout. The words “native” and “cutthroat” are synonymous, as all other trout found in Yellowstone are non-native. One of the most intrusive introductions has been lake trout that have taken quite nicely to Yellowstone Lake. Massive Alaskan-size fishing rigs gillnet the lake trout each summer. In 2014 alone, fishermen pulled out more than 277,000 of the intruders. Other pressures threaten the cutthroat, too: the parasitic whirling disease, habitat degradation, extended drought conditions. As a critical food source for at least 42 other species in the park, the cutthroat’s steep and speedy decline signals a slide toward endangerment—and not just its own. We ran for 30 miles around the east shore to arrive at camp on the far end of the South Arm where our porters canoed in to meet us. I burrowed into my sleeping bag and gazed out the tent door. Appreciation washed over me. Our plan was actually working, the weather was holding and my body was cooperating. 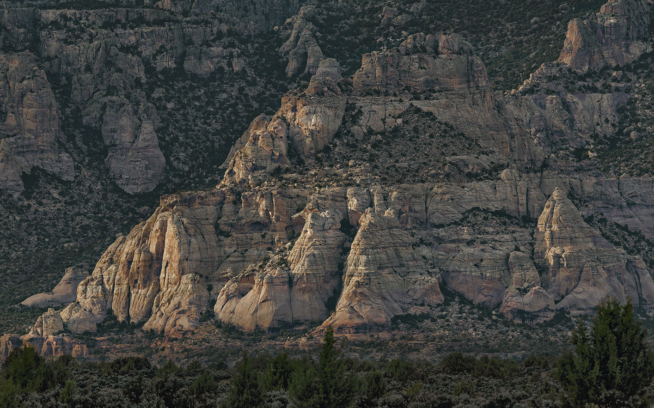 The remote country was wild and nourishing. DAY 4. All this time, we’d been on the lookout for grizzly bears. On day four, we ran through the most grizzly-dense country yet so were extra alert—we carried bear spray, ran in a tight group, hooted and hollered and clapped. But we saw no signs. Statistics tell us that a person is far more likely to be killed by a dog or a bee than by a grizzly bear. For the most part, grizzly bears want nothing to do with humans. If you don’t startle or surprise them, and if you maintain a healthy distance, chances of an attack are extremely small. Yet there’s always been a contradictory relationship between bears and humans in Yellowstone. In the 1970s, bears approached cars regularly. Visitors would hand-feed them. Bears frequented open dumps where tourists could gather by the hundreds for a photo-op. But the bears were often killed for human-bear confl­ict and hunted outside park boundaries. By 1975, only an estimated 136 grizzly bears remained, prompting federal protection as a “threatened” species under the Endangered Species Act. Hunting seasons were eliminated and management policies and public education put in place to reduce human-bear confl­ict. The population has since rebounded to today’s estimated 717. Now controversy has resurfaced with a proposal to remove grizzly bears from the endangered species list, fueling outrage amongst scientists, activists and environmentalists. Climate change has decimated the whitebark, the grizzly’s primary food source, and the swiftly proliferating non-native lake trout has cut spawning native cutthroat trout (another critical food source for the grizzly) by an estimated 90 percent. The Yellowstone grizzly bear population also needs the genetic diversity gained by expanding and breeding with grizzly neighbors to the north—an expansion that would be threatened by hunting and “management” of the bears that delisting would allow. The Yellowstone grizzly is one of the slowest-reproducing land mammals in North America, and even a slight reduction in its numbers by delisting could threaten its survival as a species. DAY 5. When I woke up, I wasn’t sure I could run. My body ached. I was limping. But there was no way I wasn’t finishing. We only had 20 miles left, and this was geyser day. 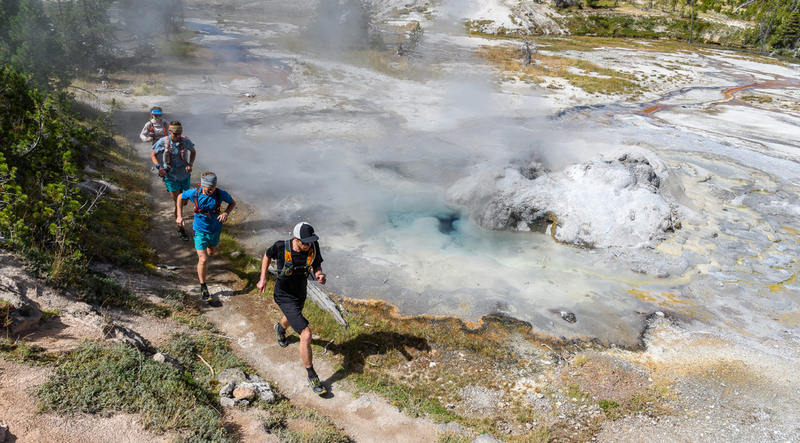 We ran about 10 miles, waded through a warm marsh and entered the Shoshone Geyser Basin—a mile of backcountry otherworldliness. There is something utterly surreal about boiling water erupting from the earth, the smell of sulphur, turquoise pools of water, warm steam wafting, volcanic magma churning somewhere not so far below. More marveling. Lots more. Eight smooth, single-track miles later—after moving through so many different microclimates and ecosystems and environmental stories—we rolled down the final hill. As we jogged into a crowd of a few hundred people standing at Old Faithful, she began to spew boiling water and steam 100+ feet into the air. After a few minutes she slowed to a sputter, and we reluctantly began the inevitable return to the world of human activity. In that moment I felt the desperate importance of these wild places—where we can get caught in rainstorms, serenaded by wind, fall asleep pressed down by stars, and where the presence of wild animals makes the hair stand up on the backs of our necks. Amidst the chaos, traffic and city lights, we have to carry these little pieces of wild with us, to make us more humble and maybe a little more aware of how the choices we make impact remote places we only visit. Just like a run, hike or climb, the consequences of our modern human lives must be measured, and each step must be precise. This story first appeared in the Spring 2017 Patagonia Catalog. 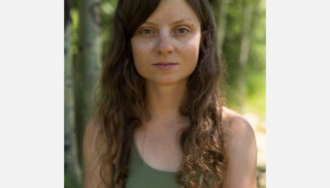 Kt is a Montana gal with a zest for adventure and knack for storytelling. She is one of only a handful of female adventure photographers capturing imagery in some of the wildest corners of the planet. Kt guides backcountry skiing in Yellowstone National Park as well as summer climbing trips on Granite Peak, the highest summit in Montana.